This game is similar to the classic ROOK® card game*. Compete against your friends and/or the computer in this classic trick-taking game. Bid aggressively for the chance to declare trump. Take tricks with pointers to reach your bid or you’ll get set! Play with your friends online or play with other people around the world using Game Center! 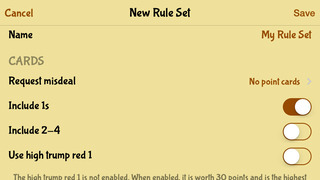 Play with two widely different rule sets (Kentucky Discard or Western Wyoming) or create your own set of rules to play with any of these options that can be on or off: • Include 1's worth 15 points • Low/high/10.5 Blackbird card • Remove the Blackbird card • Allow Blackbird card to be played anytime • Winning bidder leads the first trick • Red 1 worth 30 points • Adjustable game winning score • Bonus for taking most tricks • and more! Get awarded when you complete achievements and challenge your friends to complete them. Have fun looking at all of the statistics that are tracked so that you can analyze how you play. Coming soon: • More rules customizations * This is not in any way endorsed by or affiliated with Hasbro, Inc. ROOK® is a registered trademark of Hasbro, Inc.
You can now purchase a Christmas theme for the game! More themes are coming including some free ones.